Cherry Queen is Hungary’s most popular brand of bonbons and the market-leader among alcoholic desserts. Little wonder, too, since this confection, always ready to innovate while still respecting tradition, is more than a special object of pride in Hungary. In providing a special experience regardless of age, gender and occasion, it establishes a common understanding which includes both respect for traditions and great esteem for the recipient. 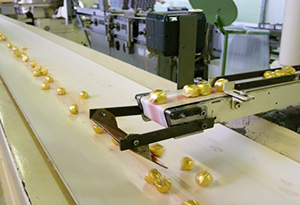 This is why Cherry Queen has become one of the Bonbonetti Group’s most successful products. 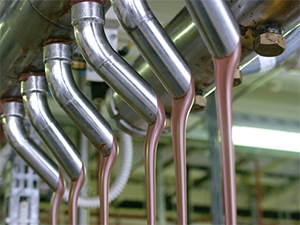 The best-known, machine-manufactured, consistently high-quality cherry liqueur chocolate received the Cherry Queen name in 1996, and since then we have been producing them based on the unchanged, original recipe, with only the wrapping being renewed, and more and more types of packaging being added. The secret behind the extraordinary liquid cream hidden underneath the chocolate shell is that the alcoholic cherries liquify the fondant over the course of several weeks. The process was mechanised in 1964, as a result of which, the procedure was reversed: ever since then, we first form the chocolate casing, and then the cherry and alcoholic cream are inserted into it. … but how does the cherry get into the bonbon? The crispy cherry– carefully selected, pitted and soaked in alcohol – can hardly wait to meet the fondant cream and the chocolate.. The cream extruders dispense fondant cream onto the cherry in the shell. Owing to the cherry’s high moisture, acid and alcohol contents, the fondant takes 2-7 days to soften and liquify. This is when the cherry liqueur chocolate gets its perfect crispy-liquid quality! Prior to wrapping, watchful eyes and careful hands remove any damaged bonbons.